How can we compute the array response? What can we learn from these scenarios? What does a wave look like in this scenario? Although this example was admittedly somewhat contrived, it is not far fetched. Arrays similar to those that I have been discussing are widely used inthe technology area of spatial signal processing. 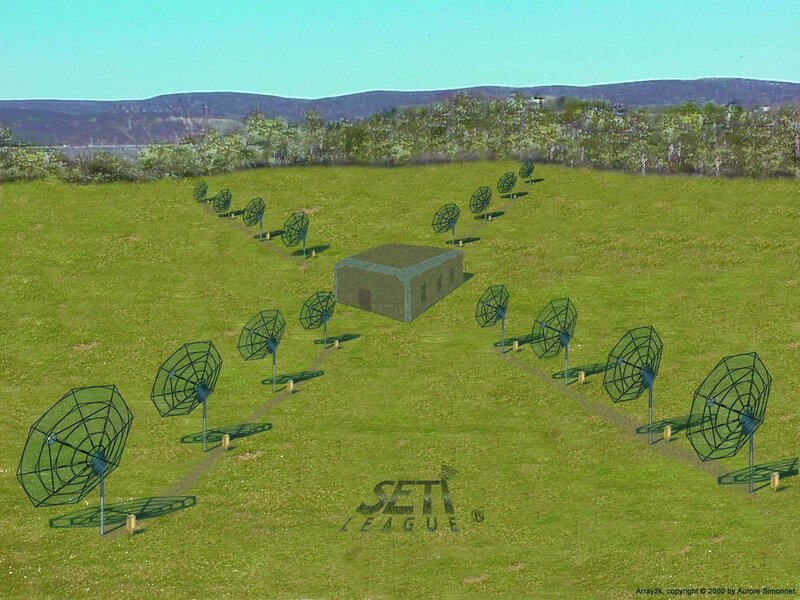 Perhaps the application that is most familiar to the general public (due to widespread publicity and a very popular movie) is the Paul Allen radio telescope used in the Search for Extraterrestrial Intelligence (SETI) . In the past, much of this work has been done using a very large dish antenna known as the Arecibo Radio Telescope in Puerto Rico. Efforts are now underway involving an alternative approach that uses a large array of small dishes instead of one large dish. By properly processing and then summing the outputs produced by the dishes in the array, the users will be able to steer the telescope and possibly to alsoeliminate strong sources of interference. Arrays of seismometers are used by U.S. government agencies to monitor for seismic signals produced by earthquakes in locations nearly halfway around theearth. By applying complex, frequency dependent weighting factors to the seismometer outputs before summing them, the arrays can be tuned to provide a complexresponse in wavenumber space. For example, the arrays can be processed to form response beams looking in different directions with a beam width that isrelatively constant across a wide band of interesting frequencies. In addition, null points in the wavenumber response can be created to suppress seismic noisethat originates from specific points on the earth such as mines, rock quarries, and cities. The design and analysis of such array systems use 2D (and sometimes 3D) Fourier transforms. Because the weights that are applied are produced by complexfrequency filters, the transform programs that are used must treat both the space domain data and the wavenumber data as complex (instead of being purely real as in the examples in this module) . Probably ninety percent of all sonar systems currently installed on surface ships and submarines use arrays for steering and processing both active andpassive sonar. In almost all cases, these are 3D arrays. Some of the arrays contain multiple sensors on the surface of a portion of a sphere. Some containmultiple sensors located along slats that are mounted on a frame much like the staves on a barrel. Some are located on the sides of the vessel. There areprobably numerous other geometries in use as well. A Fourier transform program used with these arrays would normally have to be a 3D Fourier transform program capable of transforming from complex spacefunctions to complex wavenumber functions. One of the reasons that sonar is typically processed using arrays has to dowith the wavelength of the signals and the operating environment. It is usually not practical to physically move a sonar sensor large enough to do the job inorder to cause it to look in different directions. Thus arrays of small sensors are used with the ability to steer beams electronically in order to look indifferent directions.